After much request Crossbreed is proud to offer a secure yet easily accessible OC ("oleoresin capsicum") carrier. Based on our extremely popular modular holster system the Modular OC holder can be attached to any loop sided fastener. This allows you to have your OC in a set location mounted to your Purse defender, Pac Mat, Bedside Backup, or any place you decide to put an optional piece of loop side fastener. No longer will you have a can of OC in the bottom of your purse or be forced to use the small lockable models to keep them from spraying in your bag. Accompanied with the Modular holster, magazine, flashlight, handcuff, and OC carrier wherever you go whenever you go we have you covered. The OC carrier works with all 1.5” bodied OC such as ASP, BioShield, Defense Technology and Fox Labs. *OC not included. 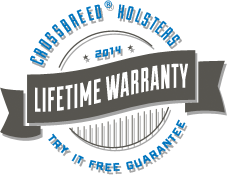 * As with all of our products, the OC carrier comes with our “Two Week, Try it Free Guarantee" and the CrossBreed® Lifetime warranty. Product Size: 3.5" x 1.75" x 3.25"